The march progressed through Sutton and Baldoyle before reaching their destination at Howth about 1pm. The head of the march came to a halt at the Tram terminus at the entrance to the East Pier. Suddenly a sheer went up and a company of Volunteer was seen running to the head of the pier while the rest of the companies, acting on orders from their respective commanders, sealed off the rest of the harbour preventing anyone other than Volunteers gaining access to the landing stage. A small group distracted any onlookers with a drill display while what was described as a nicely-shaped pleasure yacht entered the harbour and docked along-side a group of Volunteers. There were several descriptions of how the guns were unloaded from the yacht but all agreed that it was done with considerable speed and in what appeared to be minutes all the Volunteers present were holding a rifle, some were seen with two or three. Several motorcars appeared from nowhere and the remainder of the Rifles and Ammunition were whisked away. A little before 9.30 in the morning the men began to assemble at Fairview Park. The men of the two Northern Battalions were astonished to see company after company of the southern men march in. All the company and half company commanders were in uniform - the grey and green uniforms, which were only distributed on Saturday night. Almost all the men, who numbered about 3,000, were equipped with bandoliers and all carried haversacks containing the day’s rations ordered. The boys of the Fianna Eireann arrived, bringing an ambulance cart, and all dressed up in their picturesque Irish Boy Scout’s dress. A company of cyclists headed the regiment which marched forth about 10 o’clock. It extended over nearly half-a-mile, and made a brave sight that was watched by many interested eyes. As the attack intensified Major Haig gave the order at Liffey Street that enough men to align themselves across the street to cover its width, the intention being that this line should halt the progress of the perusing crowd and allow the rest of the Column to proceed to Royal Barracks. Between 20 and 30 men were used to block the street, the men formed two lines, some kneeling. Major Haig stated to the inquiry that he felt his men would not get safely back to barracks if he did not threaten the crowd with more than bayonets. 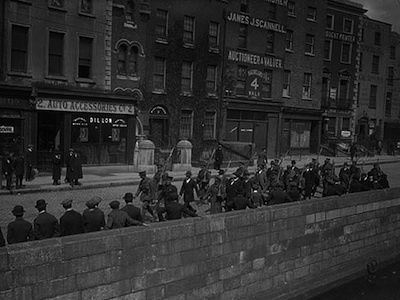 At this stage about 30 or 40 rioters joined the attack from Liffey Street and the crowd on Bachelors Walk numbered between 500 and 600.